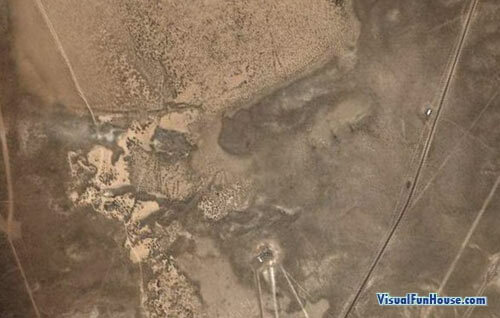 Area 51 Alien face was found on Google Earth very close to the the alien research base Area 51 in Nevada. This is a nice twist on crop circles! The face is quite distinct, and unlike a crop circle its made out of dirt rather then a bunch of squished down wheat. The alien face should be to hard to make out, it popped out at me right away. Do you think this is just a random fluke? or are aliens actually leaving their mark. hm…funny it came out on are 51. one day, when I have nothing to lose, I’m going to venture into area 51 to see what I find before I get jailed. maybe. i have lots to live for. I think someone is grasping at straws because I don’t see a face either. Maybe if you were fried on acid or something. How can you not see the face? Nope. I don’t see it either. Not even a little bit. You cant see the face?It is right in the center!I mean left in the center.Haha! Was it just me or did that alien just stare at me? why are the US military hiding area 51? am i right?